At the age of 9 Mac was inspired to send soccer balls to kids in need around the world. In the past three years Mac has built a website; raised funds; arranged for the Australian soldiers to take soccer balls to Afghanistan; met the Governor of Queensland; won a United Nations Association of Australia award; delivered soccer balls to the children of refugees in Australian refugee immigration detention centres, as well as over 4000 soccer balls to kids in 22 countries including Cambodia, Uganda, the Solomon Islands, Nepal, Tibet and the Maldives. Mac has also written a book called ‘Football – Play It Forward. A 10 Year Old’s Goal of Peace Through Soccer Balls’, which is already an Amazon #1 Best Seller. Mac is a leader in the making. He spends his free time writing letters asking for support and speaking at events such as Rotary to raise money and awareness of the plight of children who have not had the same opportunities as him to play sport. Last year Mac completed speaking tours of India and China. As a guest of the Rotary, Mac has spoken to 33 schools and over 11,000 students about why he thinks soccer balls can be an instrument for peace. He was invited back to Shanghai to complete a TEDx Talk. Just recently Mac has been awarded a Paul Harris Fellow by a local Rotary Club in his home town of Brisbane. 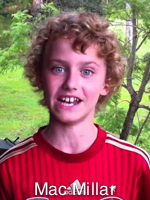 Mac, now aged 12, is a talented soccer player who one day wants to play for the Australian Socceroos and Manchester United.